Venue: Full Gold Restaurant, 2/F Yau Lai Shopping Centre, Yau Lai Estate, Yau Tong, Kowloon. Totem Run will take place on Sat 6 & Sun 7 Oct 2018. Briefing session will take place at 19:00 hrs on 2 Oct 2018 at HARTS CSSC. - The application deadline for HARTS Teams will be set on a date two weeks before that of the public teams managed by Oxfam. - The minimum requirement to qualify to take part in a HARTS Team is Associate Membership. Applicants are required to form teams of  participants. A scoring scheme will be used to rank the priority of the applicants. Life Member/Full Member: 4 points each; Associate Member: 2 points each. The teams with the highest scores will represent HARTS. Lots will be drawn in the event that more than one team attained the same score. - Change of team members is not allowed after an application is submitted. - Should any dispute arise, HARTS Excom’s decision is final. This is a rare appearance of VR2UW. Be there or be square. 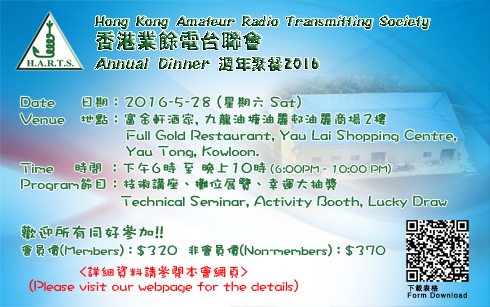 HARTS will participate in IARU HF Championship 2017 on 8-9/7/2017, at Cha Kwo Ling, CSSC. HARTS will operate as HQ Club Station using special callsign VR20HK. VR20 prefix is to celebrate Hong Kong Special Administrative Region commemorating the 20th anniversary of Hong Kong’s reunification with China, Hong Kong licensed radio amateurs are being allowed to use the special prefix VR20 on a voluntary basis from 1 July 2017 to 30 June 2018. We sincerely thanks Ravi for this sharing !! This HF workshop will be scheduled at 1400 to 1600 hrs on 18/3/2017 at the HARTS Communication Support Services Centre (CSSC), 429, Cha Kwo Ling Road, Yau Tong. 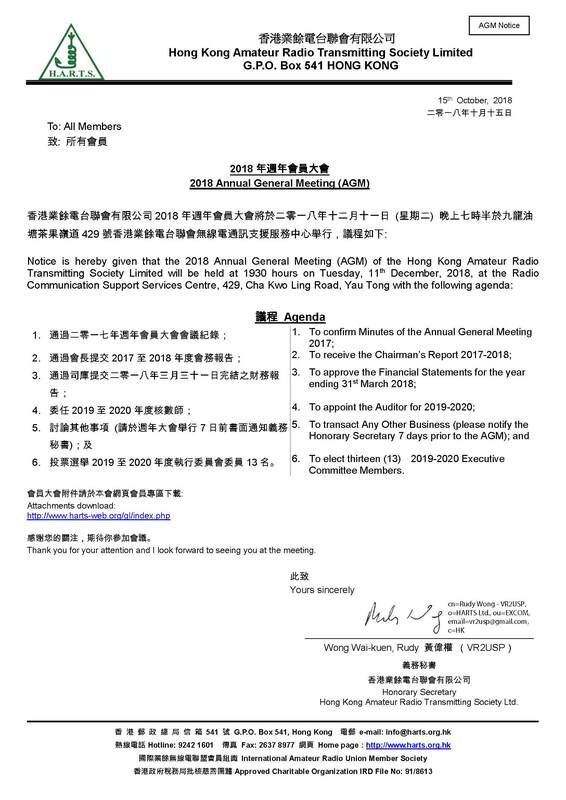 FT-8900R operating workshop will be scheduled at 1400 to 1600 hrs on 25/3/2017 at the HARTS Communication Support Services Centre (CSSC), 429, Cha Kwo Ling Road, Yau Tong. This month, our regular monthly meeting slot coincides with St. Valentine's Day. As a result, the monthly meeting of February 2017 and the briefing session for both "Hike the Hill for Hospice" and "Hong Kong Mine Challenge" has been rescheduled to 19:00 on Tuesday, 21 February 2017 at the CSSC. We request the pleasure of your presence. 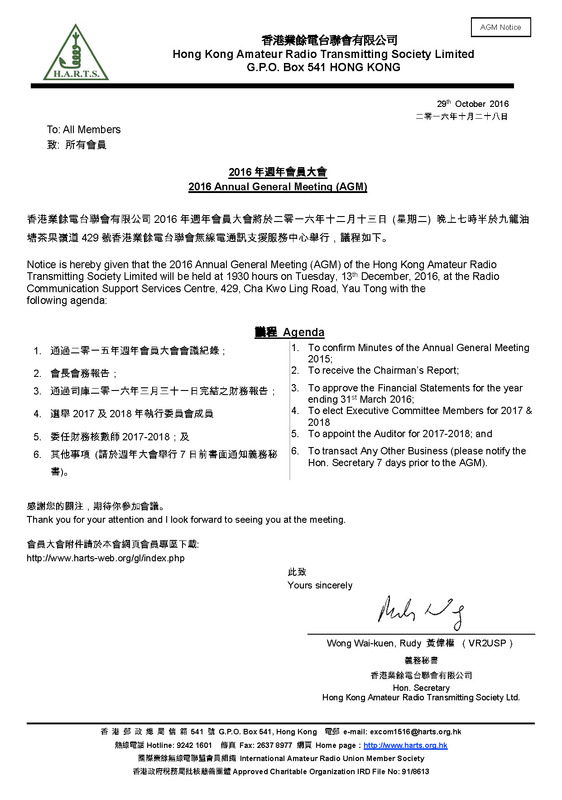 Notice is hereby given that the 2016 Annual General Meeting (AGM) of the Hong Kong Amateur Radio Transmitting Society Limited will be held at 1930 hours on Tuesday, 13th December, 2016, at the Radio Communication Support Services Centre, 429, Cha Kwo Ling, Yau Tong. A strong 7.9 magnitude earthquake struck the South Island of New Zealand at 1103UTC 13 November ( just after Midnight local time ) causing damage and local tsunami alerts, mainly for the East coast of the country. The local emergency communications group AREC part of NZART are believed to have been operating on their normal frequency of 3.900MHz USB. Initial media reports are of property damage over a wide area but the situation will not become clear until daybreak and the end of the possible Tsunami threat. Radio Amateurs in the area with allocations around 3.900 MHz are encouraged to listen carefully and avoid QRM to any ongoing work by AREC. c. Catch 22 Awards from US$15 to US$20 (HK$160 or 60IRC). Earthquake in Taiwan An earthquake measuring 6.4 has hit Taiwan, and caused buildings to collapse. HARTS has received a weak voice signal from the CTARL Taiwan that asks that the following frequencies be kept clear. HF frequencies used in Taiwan are voice: Main is 7.060 MHz with backup 7.050 MHz and 3.560 MHz. Short range frequencies are on VHF and UHF. At least four buildings have collapsed in the south of the island. Dozens of residents are reported to be trapped in the city of Tainan, those houses nearly two million people. Tremors were felt in the capital Taipei, on the other side of the island, and aftershocks were felt. Taiwan lies in the 'Pacific Ring of Fire' and in 2013, four people were killed in a 6.3-magnitude quake. -Jim Linton VK3PC, IARU Chairman Disaster Communications Committee. The United Nations Educational, Scientific and Cultural Organisation UNESCO theme for World Radio Day on February 13 2016 is, 'Radio in Times of Emergency and Disaster'. UNESCO recognises that the immediate access to radio frequencies is essential in saving lives, and should be protected so they are available in times of emergency. World Radio Day that began in 1946, will this year include sending to broadcasters free articles, audio and video messages from opinion leaders, celebrities, and UNESCO Goodwill Ambassadors. Starting from April 2015, all monthly meetings, event briefings, workshops, etc will be held at HARTS Communication Services Support Centre (CSSC), opposite to Wing Shan Building, 428 Cha Kwo Ling Road, Yau Tong. HF, VHF and UHF radio stations will be set up after basic decoration work of CSSC is completed. IARU informed that Cuba emergency net has activated on 7115 kHz after very heavy rains. Please keep clear from this freq. unless for emgergency use. HARTS had paid years of effort in application for a piece of government land for development of amateur radio communication services. In early October 2014, a piece of land near Eastern Harbour Tunnel in Cha Kwo Ling Road, Yau Tong, was granted to HARTS by Lands Department in a nominal-rent short term tenancy. We are preparing the construction work for Communication Support Service Centre (CSSC). The construction projects include Construction of main gate and associated barrier, Clearance of grass and scrub, Site formation and construction of leading road and 6 parking spaces, Construction of a 0.5m fencing wall facing the Eastern Cross Harbour Tunnel, building a 2000 sq. ft. structure, Electrical installation, water supply and internal renovation of the structure, Submission of landscape proposal and associated horticulture works, Rental of portable toilet and etc. The initial estimated budget for such construction work is not less than HK$300,000. Without support from members, radio amateurs, general public and organizations, HARTS could not establish CSSC for development of radio communication services. Please support HARTS by donationor material sponsorship. Please be informed that permission was given to HARTS by OFCA for operating DMR UHF Repeater VR2KP at Tate's Carin, Uplink 435.275MHz, Downlink 430.275MHz. Please be informed that temporary permit was given to HARTS by OFCA for trial run of DMR UHF Repeater VR2R at Tai Mo Shan, Uplink 435.400MHz, Downlink 435.400MHz. for settings information on colour code, time slot and ID. IARU informed that the amateur radio emgergency frequencies in Philippines after Typhoon attack are 7.095, 7.119 and 7.195 MHz. Please keep these channels clear.